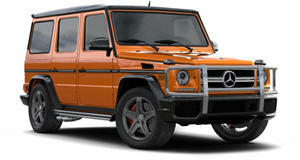 The $600,000 Mercedes-AMG G63 6x6 is one of the craziest cars ever made. It's also very rare. So we’re not overly surprised to find that some young whipper snapper has drawn inspiration from the six-wheeled monster to create his very own BMW 6x6, which we can assume will be done at a fraction of the price of the AMG 6x6. This is the only image of the car we could find, via ifcar on Instagram, and as you can see a BMW X5 is being used as a donor car for the impressive project.